Nrtta, the abstract or pure dance, consists of axial geometric movements to illustrate the beauty of tala (rhythm) and raga (melody). Every abstract dance sequence is entirely planned according to the tala-system (rhythm and measure) of the Carnatic (South Indian) music. The basic movements of nrtta are called adavus. The word adavu derives from the Tamil word adu - to dance. 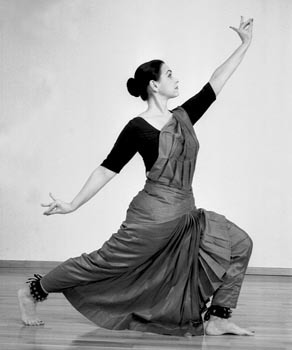 The characteristic main position is the araimandi oder ardhamandala position of the legs similar to the demi plié position in classical western ballet. The main position of the arms - a parallel and horizontal position from shoulders to fingertips - is called natyarambha which means beginning of the dance. The adavus are performed in three speeds: vilambita (slow), madhya (medium speed) and druta (fast). 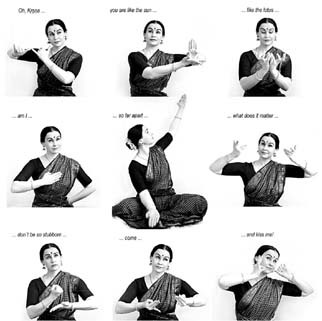 In Nrtya, the narrative dance, the medium of expression is Abhinaya: Abhinaya consists of representative body positions, of which the most characteristic are the hastas (hand positions) used to describe the content of the song with symbolic movements. Thus the dancer is able to portray the emotions expressed in the song and can therefore present the audience aestetical moments of subtle quality by identifying herself with the content of the songs which are mostly based on love themes. The contents of the songs used in the dance have their origins in the hinduistic mythology, literature and religious philosophy. They symbolise the yearning of the human soul for union with the absolute. A multitude of gods and names were created in the effort to describe the cosmic legitimacy with the use of symbols. Without knowledge of Indian mythology and philosophy Bharatanatyam fascinates the western spectator because of its sculpturesque poses and exact rhythmic movements. The colourful costumes and rich jewelry bestow additional exotic charm. The traditional jewelry consists of pearls and gems and frames the face. On both sides of the parting of the hair are sun and moon in pearls and gems. Little white flowers - mostly jasmin - are braid in the plait. The costume is made of a sari, the silk in brilliant colours. The little bells above the ankles are made of bronze; they have sacral meaning and emphasize the rhythm of the dance. Finger tips, palms and toes are coloured in red to symbolize the petals of the red lucky lotus.